I recently had the privilege to present to some amazing educators from around the world at FETC 2012. I had an amazing time connecting with other “game-changers” in this profession. I want to thank you for the great discussion in person and on the Twitter. At FETC I was presented the IE PD workshop, Blogging with a Purpose. While we packed lots of info into our hour-long session, I was unable to get to the finer details with that time constraint. So, I am going to follow up with the Classroom Blogging Series – where I dive deeper into some of the details in blogging in the classroom. I am often asked about student safety in the online environment. While I am an advocate of an open Internet in schools, where we teach responsible use – I also understand the many valid concerns. Here I will outline the settings that you can change to address many of these concerns. For the sake of this post, I will address the blogging platform WordPress and Blogger. Most of the safety concerns on WordPress can be addressed from the “Settings” menu from your “Dashboard”. 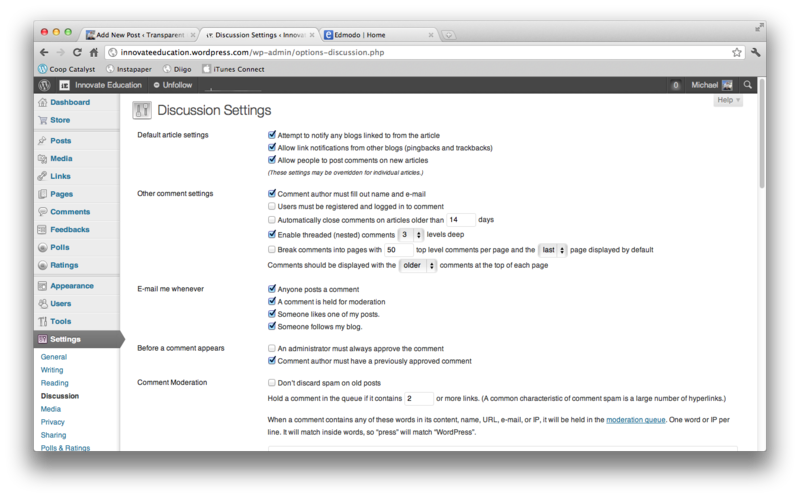 The “Settings” menu has a submenu titled “Discussion”, which will allow you to control comments on student blogs. Unchecking this option will disable the ability to post comments on the student blog. While this is the easiest way to shut off the ability for two way communication, I think that the ability to use comments for feedback is monumental. Checking this box will require all commenters on articles to be signed in with either a WordPress account or other account (Yahoo!, Google, etc…). Probably the best way to keep student blogs secure. It does require some work on your end however, requiring you or your student to approve the comment. This would be my recommendation for THE setting to change on all student blogs. 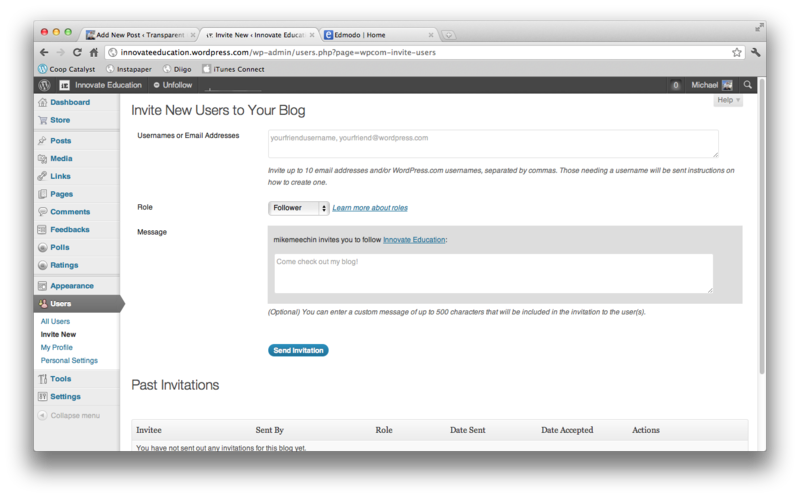 On WordPress you also have the ability to “blacklist” words for comments. It is a nice feature, but not necessary if you are going to approve comments prior to being posted. This should be a non-negotiable. All students that maintain a blog should add you as an administrator. Here is how. Choose “Users” from the left menu then “Invite New” from the submenu choices. Have the student enter your email address, then CHANGE YOUR ROLE TO ADMINISTRATOR. Click “Send Invitation” and that is all. You will need to respond to the email, but then you will be able to change all settings on that students blog. This process requires some work at the beginning of the year, but only needs to be done once. Most of the safety concerns on Blogger can be addressed from the “Settings” menu from your “Dashboard”. The “Settings” menu has a submenu titled “Post and Comments”, which will allow you to control comments on student blogs. This is really the only change you need to make for Blogger. In Blogging with a Purpose I mentioned that Blogger does not have quite as many options, so this is what you are limited to. Choose “Always” and have students enter your email address in the box. That’s it. All comments will need to be approved by you prior to being posted to student blogs. This should be a non-negotiable. All students that maintain a blog should add you as an administrator. Here is how. Still under the “Settings” menu choose “Basic” from the submenu choices. Have the student choose “Add Authors” and enter your email address. What I do not like about blogger is that once you have accepted the invitation, the student must go back in to make you an Administrator. However, so long as you are approving comments, I believe you can leave this step out. As I discuss in Blogging with a Purpose, student behavior in the online environment is treated no differently than is a student were standing in front of me having a conversation. They key to student safety is to outline strong procedures, policies and consequences in the classroom. Take the time to teach responsible use. For more information about the Blogging with a Purpose PD workshop, please visit Innovate Education. All workshops can be fully customized to the clients needs.